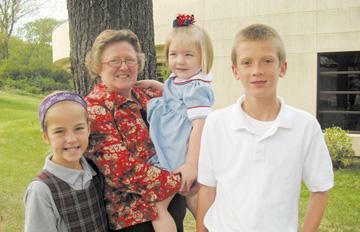 Oak Hill School principal Deborah Steurer, Ph.D., with her students. Last year Villa Duchesne Oak Hill added a pre-kindergarten class for the first time since the Sacred Heart academy opened its doors in 1929. 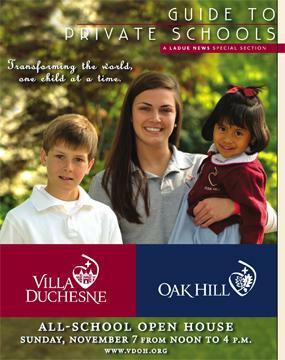 Originally founded as a day and boarding school for girls, Villa Duchesne began admitting boys in 1971, and the lower school through grade six was named Oak Hill in 1973. Today, Oak Hill serves boys and girls in junior kindergarten through sixth grade, and Villa Duchesne continues its mission of educating young women in grades seven to 12. The Sacred Heart tradition is integral to a Villa Duchesne education, says Steurer, with an emphasis on the five goals, faith in God, respect for learning, a commitment to service, building of community and personal responsibility. “Our goal is to inspire children to be responsible, compassionate members of society. It’s part of who we are,” she explains. “Our students learn firsthand how their actions have a direct impact on the world around them by participating in a variety of community service projects. Students learn to act with open minds and open hearts.” After hearing that a classmate has an autistic sibling at another school, students recently organized a fundraiser, raising more than $2,200 for that school.